In the U.S., the advent of modern farming techniques and wire fencing have all but relegated the drystone wall to the dustbin of history, and the old stone fences- which should be a relatively permanent fixture of the landscape, are now slowly disappearing, as new development takes its toll, or even worse, as unscrupulous stone yards harvest the stone from these walls, able to charge a premium for the weathered quality of the stone. It seems a shame that the U.S. cannot take a cue from the Old World where efforts have been made to preserve the pastoral character of the landscape, in which the various forms of stone fences, dykes, and hedges play such a critical role. Before the advent of mortars, all stonemasonry utilized drystone techniques. The oldest examples of this style of construction that still stand are the megalithic stone temples of Malta, the earliest dating from 4000 B.C., predating both the Pyramids and Stonehenge. The Stone temples of Malta utilized post and lintel construction, as well ingeniously corbelled stone which allowed half domes to be constructed, which were then covered with timber and animal hide. 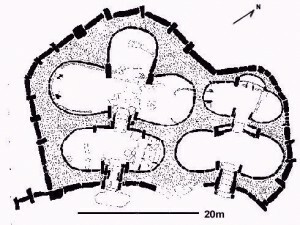 The temples typically featured an imposing entrance, from which one proceeded to a more intimate grouping of hemispherical apses, often arranged in a cloverleaf (tri-foil) pattern. Little is known of the people from this period, but the sheer size of the stones utilized implies a concerted effort from the populace, utilizing techniques lost to history, probably not unlike those used at Stonehenge (Gunther 1). 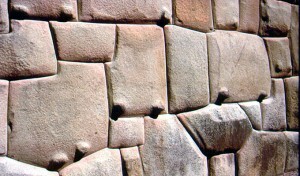 Another interesting example of early drystone technique is provided by the Inca from fifteenth century Peru. The Inca utilized an Ashlar-type stone to build terraces and freestanding walls of astonishing workmanship. In many cases, the blocks are cut so perfectly it is impossible to slide even a knife between the individual stones. The freestanding walls built by the Inca utilized a double wall architecture, where the exterior portions of each wall lean into each other in what’s called a ‘batter’. 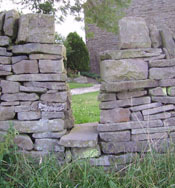 This same method was utilized by drystone masons throughout the middle-ages and is still used to this day (among other techniques) to impart greater strength to drystone structures. Of special note however, is the use by the Inca of oddly shaped, often trapezoidal stones arranged in a jigsaw-puzzle like fashion. These stones allowed the walls built by the Inca to absorb and withstand the lateral and vertical stresses of the powerful earthquakes of the region, and then return to their original position as the earthquakes subsided (Wikipedia, Incan architecture ). With the advent of the first lime mortars in Egypt, followed later by the invention of hydraulic cements in ancient Greece and Rome, drystone masonry began to play less of a role in the construction of dwellings and other structures, and found greater use in its modern role as an agricultural enclosure. This shift in use did not occur overnight however, given that the technology of hydraulic mortars and cement (which had been perfected by the Romans) was then lost for nearly two millenia during the Middle Ages, where we see cathedrals and fortifications constructed with only simple lime mortars. Given that lime mortar can be degraded by contact with water, many of these structures have been damaged by wind blown rain over the centuries (Wikipedia, Mortar(masonry)). 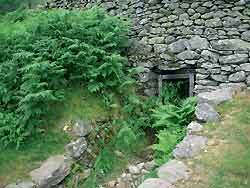 Thus even in the Middle Ages, we still find occasional fortifications, bridges, dams, kilns and other structures utilizing drystone techniques, where these had been all but abandoned in Roman times. 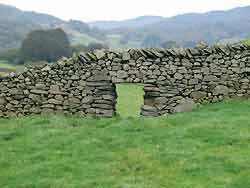 Ultimately however, drystone masonry assumed the role as the method of choice for the agricultural enclosure, and we will see a profusion of styles, terminology, and construction methods over the centuries. Any discussion of drystone walls requires a bit of understanding of the terminology used, as this varies from region to region, as well as an understanding of basic engineering involved. 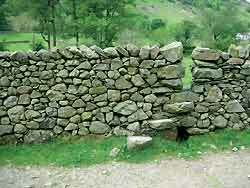 Most simply, a dry stone wall (also known as a dyke in Scotland, or a stone fence in parts of the U.S.) is any wall that is constructed without the use of mortar to bind the stones together; instead the wall is bound together by the weight of the stones, and, hopefully, by the careful selection and interlocking of stone on the part of the mason. 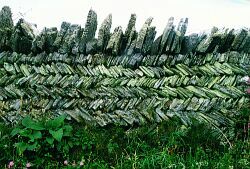 Most commonly dry stone walls were created by a farmer who was clearing a field in order to grow crops, and who subsequently added to the wall in following years as frost-heaving brought new stone to the surface of the farmer’s field. 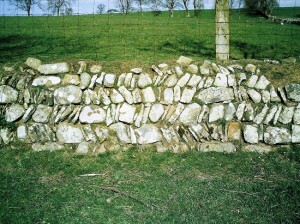 This type of dry stone wall is typically called a tossed wall, or dry-stack wall, and may often be a somewhat haphazard construction, as the first stones unearthed by the farmers were often very hard, rounded glacial till that were very difficult to work with and resulted in the rubbly ‘tumble-down’ appearance we find in the older stone walls of New England. 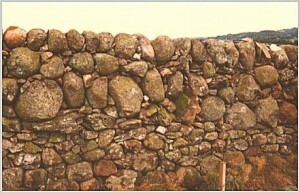 When stones are more carefully placed in double walled design, and filled in the middle with rubble, the wall is usually referred to as a dry-laid wall, and one will find these constructed by farmers with greater masonry experience, or by masons in the form of ‘fancy’ or ‘estate’ walls; walls surrounding private residences of wealthier farmers and homeowners that have little purpose (beyond aesthestic). 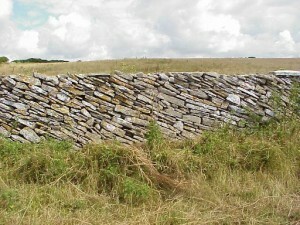 These terms are somewhat interchangeable however, and shouldn’t be too relied on to classify a wall, as ultimately the structure and design of a dry stone wall is determined by the kind of stone available and the aesthetic choices of the mason, though, as we will see below, there are certain ‘best-practices’ in drystone masonry which can result in a wall that will last centuries. 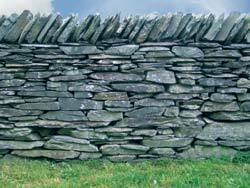 Naturally, drystone walls were also constructed as barriers for livestock, and in this use we find many of the characteristics that make up a durable stone wall that will stand the test of time. 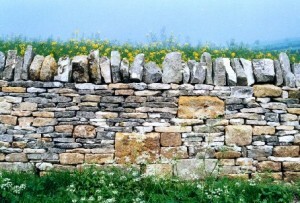 To begin, a drystone wall does not typically require a deep foundation as is required with other masonry work, as the wall is able to bend and flex with the movement of the earth during periods of warmth and frost (though a foundation below the frostline will certainly add to the life of the wall). Typically only the topsoil is removed, and a course of heavy foundation stones is laid. The foundation course is typically laid wider than subsequent courses as this provides more support should any stone shift outwards over time. Following this stones are laid in the time honored ‘one over two, two over one’pattern ensuring that each joint, or break between stones, is crossed. Individual stones are selected for the best looking face, and laid so that the angle of the face of the stone matches the overall batter, or slant of the wall. The center of the wall, or ‘hearting’ is packed with rubble or unattractive stones that aren’t useful for the face of the wall. The packing of the wall is an integral part of it’s structure, and as each face stone is placed, packing is also placed underneath and behind the stone to ensure many points of contact with adjacent stones. A good mason will typically strive to use the largest stones that can fit in the available space between the two faces of the wall, as larger stones will break down more slowly than smaller, increasing the lifespan of the wall. Packing from behind each stone, instead of chinking from the front, ensures that stones don’t fall out, weaking the wall, but also ensures that as the smaller ‘hearting’ stones break down over time, the wall will settle into itself, actually becoming stronger. You will see in the provided picture a course of tie-rocks (also called through-stones) laid halfway up the height of the wall- these are longer stones that extend the full width of the wall, and are placed around every three feet along the length of the wall. These stones serve to tie the two faces of the wall together, providing additional structural support, and ideally will stick out an inch or two from the face of the wall, which helps resist settling in a fashion similar to the wider foundation stones. Sometimes throughstones do not protrude as the does the foundation, which may be an aesthetic choice made by the mason, but this does reduce the lifespan of the wall. At the top of the wall you find a cover course of heavier stones that extend the width of the wall, and on top of this you might find a decorative (and functional) coping (a row of stones placed in a vertical or diagonal fashion). The use of a coping is more common in the U.K. and only typically found in the U.S. in communities that were once very English, such as Newport, Rhode Island. 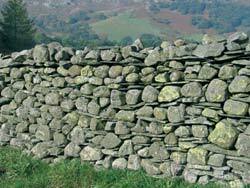 One of the interesting aspects of a drystone wall is its resistance to the effects of water. Rain water can simply drain right through a drystone wall, and wind can pass through the sides, drying it out, whereas in a mortared wall water can infiltrate the cracks in the mortar, and freeze/thaw cycling will eventually cause the joints in the mortar to fail. As a result, drystone walls can frequently outlast mortared walls, and indeed there are well built drystone walls in the U.K. thought to date to the fourteenth century and earlier (Wikipedia, Dry Stone). That said, a drystone wall is not immune to water, and the aforementioned cover course serves two purposes, one is to add additional wieght (and strength) to the wall, and the second is to protect the top of the wall from leaf litter and other debris accumulating inside the top of the wall. Over may years, this material breaks down into dirt, which can absorb water, making the wall slightly subject to the freezing and thawing that plagues mortared walls. The coping on top of a drystone wall typically consists of stones that have no proper flat surfaces that one might want to use in the face of the wall, and so is a good way to make use of what might otherwise be considered waste rock. The coping also adds weight to the top of the wall, and serves the second purpose of protecting the wall from large livestock who might attempt to browse for forage by reaching their necks over the wall. The sharper and often irregular shapes of coping stones make this too uncomfortable and helps to prevent these hefty beasts from shiftng the stones near the top of the wall which have less support than those below. 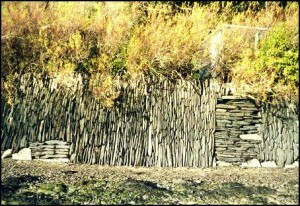 Here we see square recesses for beehives called Beeboles: (Fellsanddells.org, Drystone Walls). 'Bee Boles' for some lucky bees! One can see how these features might still have a use in a modern landscape. A Step Stile might be used as a series of ledges for planters, whereas a Beebole might be used to frame a plant or garden ornament. 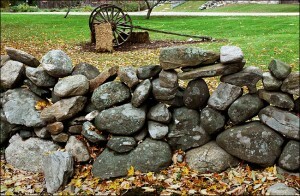 In America, drystone walls are often attributed to the colonial period, and are seen as representative of the hard labors endured by the Puritans as they hacked an existence out of the wilderness. However, as the countryside was slowly cleared, wood was in abundance, and this wood was made use of for fences. The early settlers were also accustomed to working land in common, and formed small villages with common fields on the outskirts. This was done in part because this was what they were familiar with, and also because the threat of Indian hostilities made many fearful to venture out past the protection of the settlements. It was not until these Indian threats were ‘contained’, and “the New World’s great abundance of land began to change the colonial mindset, that the system of common fields came to be seen as a waste of both time and land, and farms were established as the cohesive isolated units we know them as today.” (Allport 32). Additionally, early settlements were frequently located near estuaries, with a sufficiently thick layer of alluvial soil for farming, and it wasn’t until settlers moved out into surrounding rocky uplands that a large amount of rock needed to be cleared (Thorson 77). The early Americans also used large amounts wood for structures, fences, and most importantly for fuel, and as the colonies expanded, the rapid development led to it’s diminished availability. Lastly an increased interest in the raising of sheep towards the end of the 18th century caused an increased need for pasture fencing, for which wood was [becoming] scarce. Thus the stage was set during the Revolutionary period for a boom in drystone wall construction, and “millions of stone walls were built after the beginning of the American Revolution between 1775 and 1825” (Thorson 104). 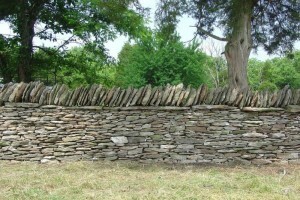 Interestingly, some sixty percent the wood fences in the 1800’s were built in the split-rail, zig-zag (or ‘worm’) style that did not require any fence posts, (as often the soil was too rocky to drive posts into) and we even find some early drystone walls built in a zig-zag pattern as well. This wouldn’t appear to make much sense at first, until we realize that the early farmers were actually throwing stone along their zig-zag wood fence as they cleared their fields, and after many years this collected into a wall with a very distinctive pattern (Allport 43). As the farmers cleared their fields each spring, they tossed the frost-heaved stone next to their original wood fence, until there was so much stone that they needed to stack it to maximize the amount of arable land. Since additional stone seemed to magically reappear each year, the farmers must have wondered where all this new stone came from. Some naturally declared it to be the work of the Devil, and others swore that the stone grew from seed, as in an old New England maxim: “Maine’s number-two crop is potatoes, Its number-one crop is stones” (Allport 59). 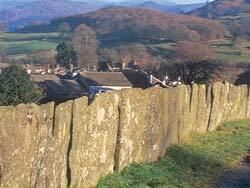 Often however, the ground would be so rocky that a zig-zag fence, or a drystone wall would be the only option. “At the same time that New England farmers were beginning to convert their wheat fields to sheep pastures, a development was taking place in the towns of New England that would eventually transform the nature of farming in the region, as well as contribute to the 19th century wall building boom. This was the growth of manufacturing. Or, rather, not so much the growth of manufacturing itself, but the growth of an industrial or manufacturing population- a population that needed the goods that farmers produced” (Allport 96). The new demand for agricultural products led to progress and differentiation in farming, as well as increased wealth. Farmers were able to improve their stock, renew depleted soils, and rebuild their fences. 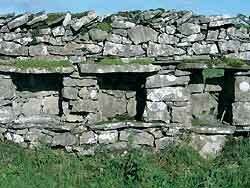 “Most of the publications of the period advised their readers to replace their ‘half-rotted, worm eaten’ fences with stone walls and that when building those walls, they should spend the time and money to build them well” (Allport 99). In 1842, The Cultivator reminded farmers that “good fences prevent eructations of bile among neighbors, contribute much to the good appearance of the farm, prevent the destruction of crops, and check in the bud that disposition to live at large which exists in most animals” (Allport 99). The walls that received the most energy on the part of the builders were those that surrounded their farmyards, garden plots, town pounds, (a storage place for livestock) and cemeteries. These would often receive a proper foundation, and be carefully laid. Many of these still survive today. Ironically, contained within the industrial revolution and the agricultural improvements of the 19th century were also the seeds of the demise of the drystone wall. “The family farm came to be seen less as a home to be lived in than as an exploitable resource to be managed for personal gain. This ideological shift coincided with the realization that the larger, stone-free fields of the praries would yield a higher profit, given the transportation improvements that were taking place. Economic incentive rather than individual liberty and self-sufficiency became the guiding principle of land use.” (Thorson 154) After the Erie Canal opened, farmers began to move west to take advantage of the wide rock-free expanses, and the exodus reached great proportions when by 1850, one half of native born Vermonters had moved West. (Allport 142). Western farmers were able to make use of new farming technologies such as the horse drawn “McCormick reaper, horse rakes, and seed drills, and the very great irony of the stone walls of new England is that they helped to make the use of these fast and cumbersome machines impossible“ (Allport 142). Eastern farmers were quickly unable to compete with western farmers, who were able to farm on a scale impossible in the East. Another great disincentive to remaining on the old New England farms came with the Homestead Act of 1862, which gave away vast amounts of land with rich soil, and made the small scale farming of the East a losing proposition. The final death knell of the agricultural drystone wall came when livestock farmers were also lured West by the invention and manufacture of wire fencing, which came into wide use after 1874, and meant that there was no need to maintain the drystone old walls. Vast tracts of land in the West could be enclosed in short order. To be sure it is much easier to string up barbed wire than handle the tons of stone required to build a stone fence (Thorson 169). No stone wall can last forever, and the best rarely have life spans exceeding 200-300 years. As the farms were abandoned, trees grew in the previously cleared fields, and subsequently fell on the old walls, breaking them apart. Freezing, thawing and erosion all did their part to weaken and undermine the walls. Walls built on slopes faced the inexorable pressures of soil creep, as soil slowly flowed downhill and gradually pushed walls apart. Drystone walls also found themselves ready quarries for those who needed stones for construction, and most recently, have suffered the indignity of unscrupulous stone dealers, who harvest the old walls because the lichen covered ‘weatherface’ stones can be sold at a premium to those who desire stone with an instantly aged appearance. Interestingly, one can (roughly) date a stone wall by the lichen on it’s faces. A wall of ten years or so will have just a few colonies of lichens, whereas an older wall may be nearly covered. Some lichens, such as Crustose lichens grow l millimeter per year or less, so a Crustose lichen with a radius of 3 centimeters would indicate the lichen had been living on the rock at least 30 years (Allport 183). There is no need to harvest these old walls, however, if aged stone is the aesthetic one is looking for. Lichen covered rocks can routinely be found on the scree slopes of mountains, and in this author’s experience, stone walls will grow mosses in very short order. I have seen stone walls turn green with baby mosses in as little as six months after construction, given the right conditions. 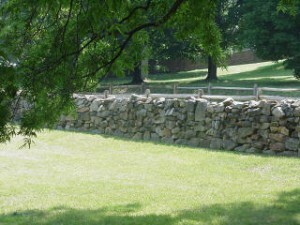 An engineer in 1939 used federal agriculture records to estimate that just after the Civil War, there were approximately 240,000 miles of stone walls in New England. It would be impossible to guess what remain today, but certainly far less, which make those that remain all the more deserving of restoration. 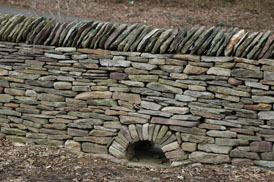 Organizations such as the Drystone Conservancy in Kentucky, and similar organizations abroad, do great work in the preservation of old drystone structures, and more importantly, in perpetuating the craft of drystone masonry. Thorson, Robert M. Stone by Stone, The Magnificent History in New Englands Stone Walls. New York: Walker & Company, 2002. Allport, Susan. Sermons In Stone, The Stone Walls of New England and New York. New York: W.W.Norton & Company, 2002. Gunther, Michael. “Prehistoric Temples of Malta” Art-and-archeaology.com. 1998. 13 April 2008 <http://www.art-and-archaeology.com/malta/malta.html>. “Incan Architecture.” Wikipedia: The Free Encyclopedia. 13 April 2008, <http://en.wikipedia.org/wiki/Incan_architecture>. “Mortar(Masonry).” Wikipedia: The Free Encyclopedia. 13 April 2008, <http://en.wikipedia.org/wiki/Mortar_(masonry)>. Brilliant article – scholarly and poetic, a powerful an appropriate combination for someone who turns nature into art. Great read! Wave the flag of stone high! You have a heart of gold Lisa- Thanks! I took a weekend course in building these fences. I am building one in my yard. How do you handle the modern day zoning laws? I ran into a “senior” department manager that did not even know what this style of fence was. He insisted it needed mortar, foundation and then be inspected. These fences have been around, as you point out, for thousands of years. Add one more reason these are vanishing, the illiterate zoning officials that can’t comprehend them. Typically fences are limited to four feet at the front property, and 7 to 7 1/2 feet on the side property (privacy fences), depending on your local zoning laws. If you are using a drystack wall as a retaining wall that (in most juristictions) is retaining 2 feet or more of grade- you might be required to pull a permit- and then you might indeed face the prospect of dealing w/ code that doesn’t take into account historic building technique. A free standing stone fence shouldn’t require any approval at all in my experience. If you are retaining grade, you can build the same kind of wall, but it must be ’tilted’ slightly at an angle to help absorb additional pressure from the soil. Don’t make the mistake of building a very low 1′-2′ drystack retaining wall, as these walls need the weight of the stone to hold them together- So bigger+heavier equals greater stability. If you have an unusual application- I’d recommmend contacting the Dry Stone Conservancy in Kentucky, they have tons of experience in dealing with ornery county officials. great article roger! i saw my neighbor a the market discussing having his “lace” stone fences taken down by builders for money. does that make sense? isn’t there so much stone already? he has old 200 yr old farmland in the hudson valley and a lot of walls, but why take the stone walls down? if it was worth $ wouldn’t other people do it? why can’t he leave the walls for the dogs?!!! I think people are after the ‘weathered’ character of the stone, as it often has lichen and moss on it. What they don’t realize is that new stone will weather in a year (and grow moss & lichen as well if it is in the right spot). I’ve had newly installed walls weather nicely and develop moss within months of installation. And too often these ‘stolen’ weathered stones will be placed in some place that is far too sunny, and the lichen, which can take decades to form, dies off pretty quickly. Would be nice if efforts were made to preserve pastoral landscapes here (as they do in Europe). But this is the U.S… and well you know- progress baby! We just bought an 1853 stucco farmhouse that we are restoring. There was an old stone wall that was in front of the house, near the road. We are having it totally rebuilt using dry stack technique. We are using Anamosa limestone as the cap stones. 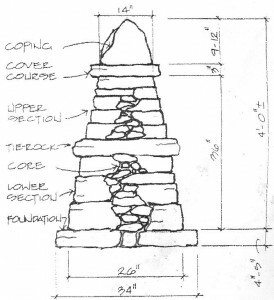 The builder proposed vertical stones as cap stones, but being from the midwest this was just so unfamiliar to my eye. I saw many examples in Kentucky and Tennessee on a recent trip, but i sort of am a believer of building what is true to an area. I have never seen vertical stones on a wall in Iowa. I am amazed at the craftsmanship and labor and skill that go into building this wall. Thank you for your excellent article! To request a Landscape Design consultation.